IT’S A BEAUTIFUL DAY TODAY! The air conditioner is off and I’ve opened all the windows in the house. The breeze blowing in as I sit here at my desk is delightful. I try to enjoy the little things that life has to offer but sometimes I forget to do that. I think most of us do. We get so wrapped up in our daily lives we don’t have time to feel the breeze on our face. When this happens I force myself to think back three years ago when I was on my chemotherapy treatments. I didn’t enjoy life at all then. I sat and watched my favorite TV shows at night. I couldn’t even get into the story line because I realized the stupid show didn’t even matter. It wasn’t real. It was just a bunch of people acting out a story. Why were the actors on sitcoms throwing out one-liners, trying to make people laugh? How could they joke around when I felt so awful? If they lost all their hair and had painful mouth sores that prevented them from eating, they wouldn’t be laughing. The commercials bothered me too. I didn’t care to hear how one mop was better than another. I used to be a clean freak. My house was always spotless. What did that matter now? I didn’t care about cleaning my house. As I sit here enjoying the soft, cool breeze on my skin I think how lucky I am to be alive. Even though my stamina is not at the level it was before undergoing surgery and chemo, that’s ok. I can live with that. I don’t plan on running any marathons. There is still so much more I want to do, and can do. I enjoy experimenting with gluten-free flours and developing new recipes. 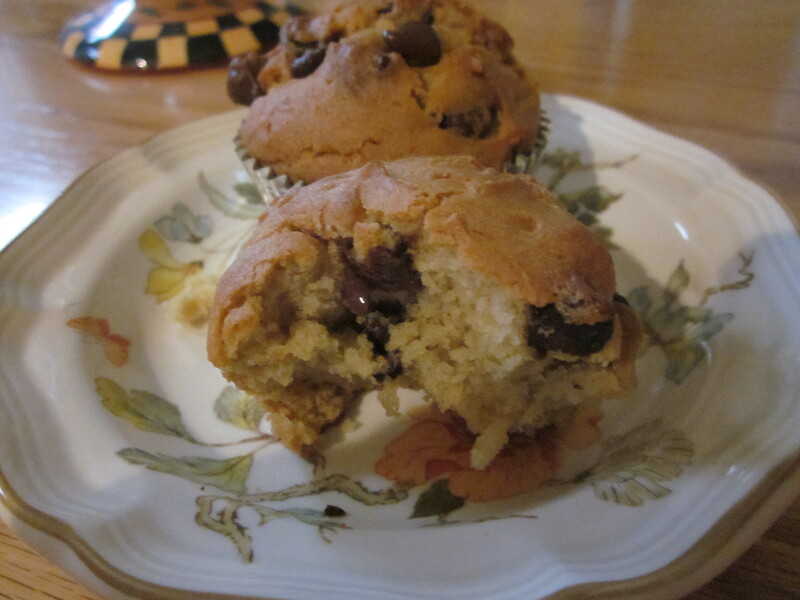 Sharing my recipes for muffins, cakes, and other desserts with you on this blog is my intent. I bake and serve them to non-celiacs at family parties and get-togethers. I want the end result to taste REAL, as I call it, and not gluten free. I look forward to being around when my kids start having kids. A lot of women I know who are grandmas say how wonderful it is. I sure don’t want to miss that. Taking my dog with me on a 30-minute walk a couple of days a week is fun. I don’t do it in the summer but now that the days are getting cooler, I can begin again. I’m still a clean freak but not to the extent I was before. I used to despise my surgical scars. Now I look at them as reminders that I survived a trip to hell and back. Twice! When I hear people complaining about trivial things I smile to myself. If you can’t fit a four-poster-bed into your master bedroom, it really doesn’t matter. It really doesn’t. Did you ever wonder what kinds of things can happen to your body if you are vitamin deficient? WELL TO BE HONEST WITH YOU, I NEVER WONDERED. I did, however, suffer through some of the painful effects. In an article written by Jefferson Adams on www.celiac.com dated 6/5/2015, he states that serious complications associated with malabsorption can occur if a person is living with undiagnosed celiac disease or if they have been diagnosed but are not eating gluten free. Chronic gluten-related inflammation and damage impairs absorption of nutrients, and likely causes malabsorption of oral medications. This can lead to nutritional deficiencies of the fat-soluble vitamins A, D, E, K and B vitamins which diminish the absorption of iron, calcium, and folic acid. For instance, I went through life with the corners of my mouth always being cracked. It may seem like a minor nuisance but it hurt. I was constantly rubbing vaseline on it at night and using chap stick during the day. Both offered some relief, but neither one cured the problem. In addition, I suffered with cramps in the calves of my legs. I never knew when a cramp was going to hit. The worst ones came in the middle of the night. The pain was excruciating! I would jump out of bed and walk it out. Easier said than done. Those cramps made me cry and it took a while to ease them away so I could go back to sleep. The other area of my body that used to cramp up quite often was my toes. One toe would literally wrap itself around another toe and latch on tight. It hurt so badly, and I couldn’t pry them loose. This was extremely painful and I would frantically take my shoe and sock off as fast as I could so I could relax and massage my toes until they undid themselves. Everyone else looking at it thought it was funny. Let me tell you, I WASN’T LAUGHING. The toe curling also happened at night when I was asleep. I would awaken suddenly and jump out of bed and try to walk it out or massage them. One time I went ice skating at the local park with my sister and brothers. In turn, my mom laced up four pairs of ice skates. No sooner did I get on the ice I got a toe cramp. I hobbled off the ice as fast as I could, unlaced the skates, ripped off my heavy sock and proceeded to massage my toes in the below freezing temperatures crying my head off. When mom saw me she said, “I just laced up your skates and I’m not doing it again!” Through my tears I explained to her what was going on. That was the end of skating for me that night. Not because she wouldn’t lace my skates again but I was afraid of more toe curling. OUCH!!! For some reason it always involved the third and fourth toes. I can’t even force them to curl up the way they used to, but you get the idea. Now, of course, we know that celiac disease causes malabsorption of vitamins and minerals. Hence the reason I had all the problems I did. Now that I eat gluten free, and I’m absorbing all my vitamins, I can thankfully report my toes never curl up anymore. I don’t suffer with leg cramps. And… no more cracked corners of my mouth. Check out the article 5 Weird Signs You’re Vitamin Deficient, by Dr. Susan Blum at http://www.blumcenterfor health.com. I feel like I’ve been a bit of a downer in my previous blogs, talking about the effects that being an undiagnosed celiac had on my body. So…this morning I’d like to share a recipe with you. 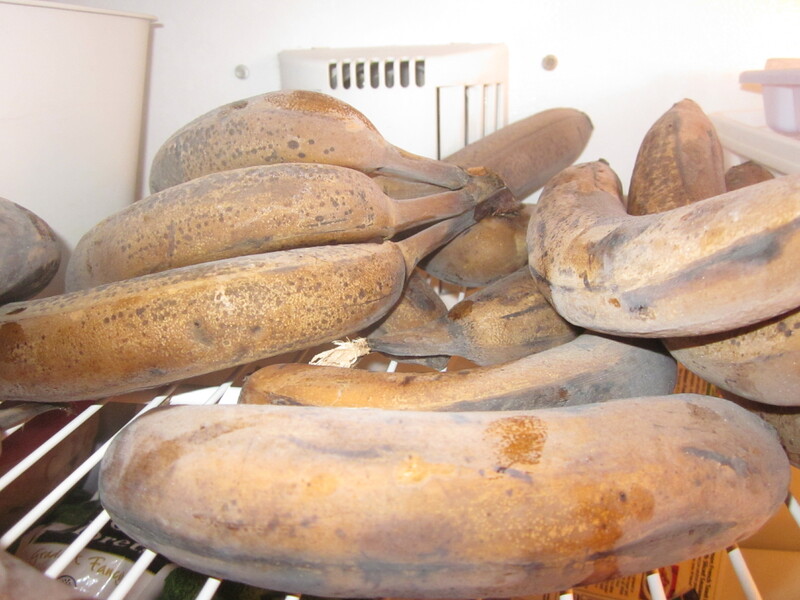 If YOUR family is like mine, no one wants to eat bananas when they’ve turned brown and mushy. When that happens, I simply put them in the freezer. Hence you eventually have a situation like this. I was in the mood to bake this morning so I decided to bake banana muffins. Did you know that the banana is the world’s most popular fruit? When I’m ready to add them to my batter I take one out, defrost it in the microwave and squeeze it out of the peel into my mixing bowl. Now I’m not a chef nor have I ever set foot inside a culinary institute. I’m simply Susan, who came up with recipes through trial and error because I was so desperate to have some delicious, homemade treats to eat that weren’t dry and crumbly. While I was recuperating in the hospital for a week after my first cancer surgery I watched the Food Network all day long. My mouth watered for all the meals and desserts the chefs whipped up. For three years prior to my cancer surgery I had been so sick and unable to keep food down. But now the thought of cooking and eating again sounded great to me. After I was released from the hospital and rested for two weeks or so I began my gluten-free baking adventure. My husband bought me a new set of clear glass bowls. Just like the ones they all use on the Food Network. My kids bought me some colorful new measuring tools. 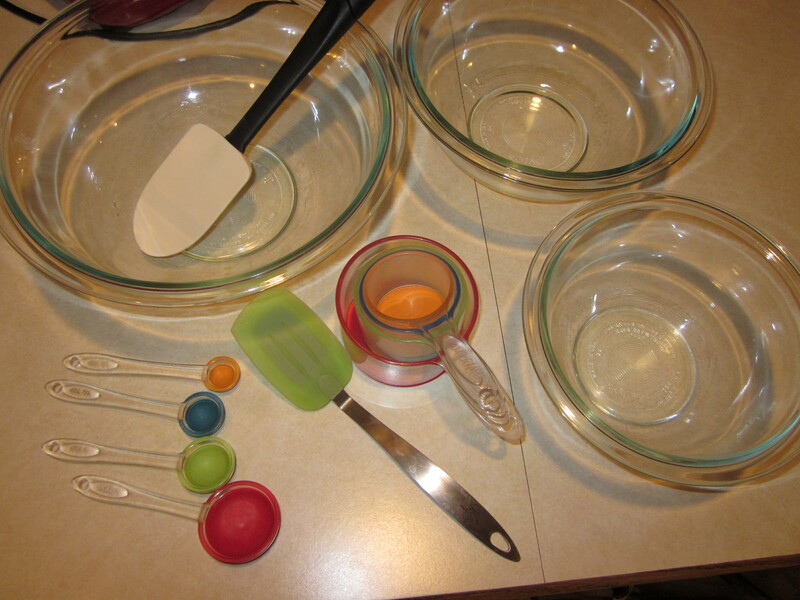 Between you and me…I liked to pretend I had my own baking show. When I set all my baking dishes and ingredients out on the counter and shouted, “QUIET ON THE SET,” everyone rolled their eyes and high tailed it out of the kitchen muttering expletives under their breath. I didn’t care. I was having fun. All kidding aside, you should dedicate certain bowls, baking pans and utensils to be used for gluten-free cooking and baking only. Unless, of course, your household is like mine. We only cook and bake gluten-free now so there’s never the worry of cross contamination with wheat products. Banana Muffins – recipe makes 1 dozen. Thoroughly combine the butter, eggs, brown sugar, vanilla, and bananas. Next combine the baking soda, xantham gum, and cinnamon to the flours. Mix dry ingredients alternately with milk into the batter until well blended. Line your muffin tin with paper liners. Scoop batter into the cups making sure batter is evenly distributed. Bake in oven for 25 to 27 minutes. Inserted toothpick should come up clear. Remove and place on cooling rack. For a variation, you can add ½ cup of chocolate chips. I prefer the milk chocolate ones myself. Or you can add ½ cup of crushed walnuts. My cousin, who is a professional pastry chef, told me that for a more finished look simply sprinkle some crushed walnuts on top before baking. ADD BOTH THE CHOCOLATE CHIPS AND THE WALNUTS FOR AN EXTRA TREAT!!! If you bake them, please let me know how they turn out. Have you ever had the urge to chew ice? At times I used to crave it. 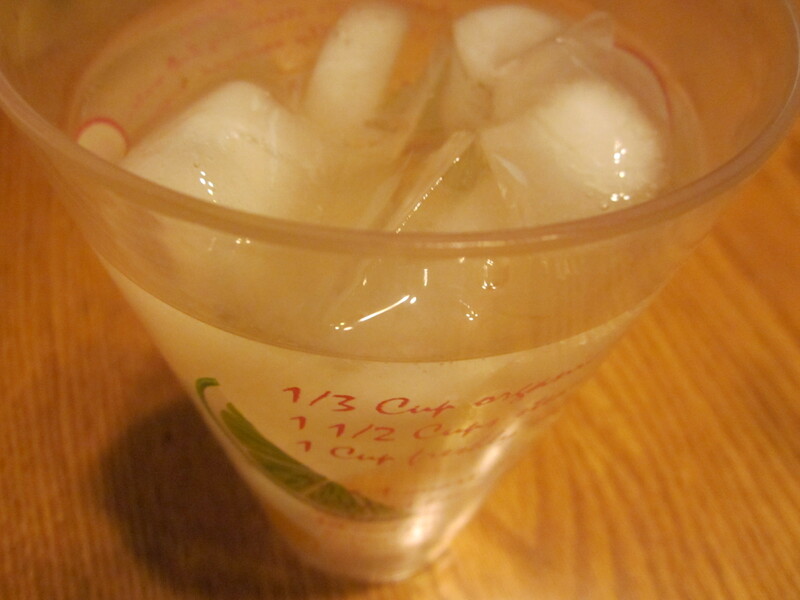 I couldn’t wait to get myself a cold drink so I could fill the glass with ice. I guzzled down the water, tea or whatever I was drinking and then spent the next glorious minutes chewing up all the ice. My sister and brothers would complain to my mom. “Mom, Susan’s crunching ice again and we can’t hear the TV.” It’s not my fault that we were all huddled together in close proximity to our 19 inch black and white television set so we could see it. I didn’t know why but I went through that annoying ice-crunching phase for a while and then other times I couldn’t have cared less about chewing ice. Years later when I was married with kids we would watch TV (a much larger one than the 19”) and again I would go through times that I would crunch on ice like nobody’s business. Now my husband and kids were asking me to stop crunching or go in another room.I have to admit that when I was crunching away, I couldn’t even hear the TV!!! I guess my ice crunching was annoying to others but I just couldn’t stop. Do you know that later my hematologist/oncologist told me that anemia causes some people to chew on ice? After she told me that I researched it further online. If you go to www.mayoclinic.org and search anemia and ice craving you will find articles about it. Or just google it and other sources will pop up as well. As far back as I can remember I was anemic. When I was a little girl my pediatrician prescribed a large bottle of iron supplements for me to take four times a year. I guess when I was taking the supplements the urge to chew ice went away. So…if there’s someone sitting near you crunching on ice, you might want to suggest they see a doctor about some blood work. They may be iron deficient. I’m happy to say that I haven’t chewed on ice for several years now. Well with some extra time on my hands this Labor Day weekend I was able to put my thoughts together and get some blogging done. I will probably be able to blog every day for a week or so and then it will drop down to once or twice a week. Did I mention that I was forty-years-old when I was first diagnosed with celiac disease? At the time I was under the impression that it basically just affected my digestive track. That’s where all of MY OBVIOUS SYMPTOMS were. Gluten ingestion can cause diarrhea, constipation, bloating, and abdominal pain just to name a few. I had no idea how it could influence the rest of my body if it went untreated. Although my doctor didn’t focus on anything but my digestive track so maybe she didn’t realize it either? I did pretty well in school up until the fifth grade. Then I just wasn’t able to retain information. My parents blamed my failing grades on my teacher. They said she was too easy on me. Now let me just say that I went to Catholic elementary school. My teacher was a nun. To those of you who also went to Catholic school, NEED I SAY MORE? The nuns didn’t let any kid get away with anything. In fact, this is the same nun who while walking around the classroom one day, grabbed hold of the hem of my skirt and pulled it to cover my knees as I sat at my desk. IT WAS REALLY HARD FOR ME TO CONCENTRATE IN CLASS. MY MIND WANDERED. My parents constantly told me that I had the ability but just wasn’t applying myself. Many nights they helped me with my homework but I had a difficult time memorizing. As hard as I studied, I just couldn’t remember history facts from one day to the next. When it came time to take a test I desperately tried to pull the information from my brain and write it on the paper but I couldn’t. My mind was a blur. Now the professionals have termed it BRAIN FOG. According to an article written by Patrick Bennett at Allergicliving.com, it’s a symptom of celiac disease for some people. This fuzzy-headedness may also be related to the fatigue that occurs in those living with undiagnosed celiac disease. As I write this blog I will repeat over and over how important it is to STAY ON A GLUTEN-FREE DIET IF YOU’VE BEEN DIAGNOSED AS HAVING CELIAC DISEASE. Don’t think of it as a diet but rather a life change. I’m not trying to make it sound easy to do. IT’S NOT! That’s why I cheated by eating gluten. There were certain foods I really missed and I didn’t want to give them up. Don’t just start a gluten-free diet on your own if you do suffer with any of the symptoms I have described so far. It’s preferable to seek out the help of a gastroenterologist who is familiar with celiac disease and get tested. Visit www.celiac.org where you will find a Celiac Disease Symptoms and Conditions Checklist. You can also search for a gastroenterologist who is knowledgeable in the celiac disease arena in your area on this website. Fill out your checklist, print it out and visit the doctor of your choice. Of course, it’s always in your best interest to find a doctor who is in your insurance network. Brain fog was the least of my worries. Little did I know that as I got older I’d be dealing with some really horrible stuff. Celiac disease affects everyone differently. The longer you ingest it, the more damage it can do. What I share with you will be MY PERSONAL EXPERIENCES ONLY. It all began when I was born. However, it didn’t rear its ugly head until I was about a year old. Then – when it did make its appearance – no one knew what to call it. Or how to treat it. As far back as I can remember, I lived a very uncomfortable life health-wise. In those early years it really wasn’t anyone’s fault. Physicians weren’t familiar with celiac disease, let alone how to test for it. When I was a baby I was hospitalized for 11 days for anemia and dehydration. It took four blood transfusions and being fed intravenously to get me healthy enough to return home. The intravenous was done through my ankles. Have you ever heard of such a thing? I haven’t but I do have the scars to prove it. I was always a short, skinny kid with a bloated stomach. I looked like someone from a third world country. 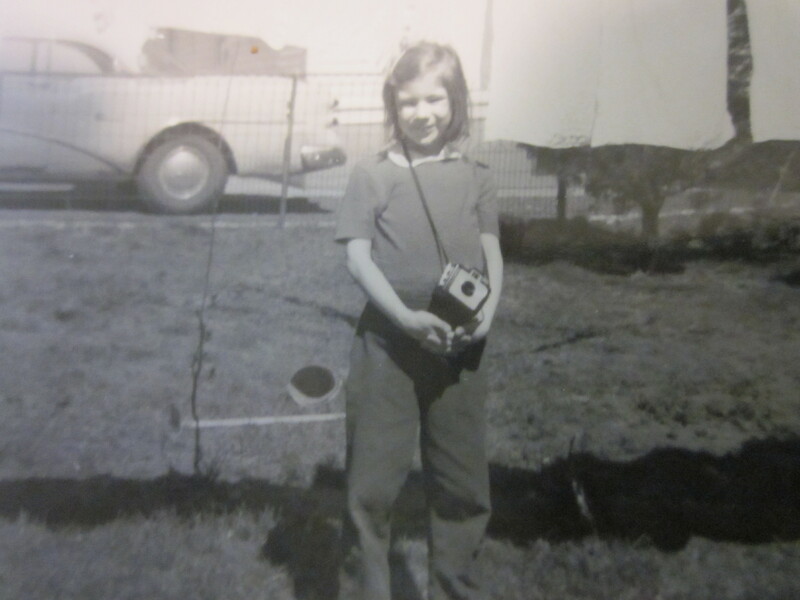 Several years ago I came across a black and white photo of me when I was eight-years-old. I looked like all the other kids in the neighborhood. But zoom in on my stomach and you would think I have a basketball tucked in underneath my shirt. No, that’s not a basketball. It’s just me in my normal bloated state. I showed the picture to my mother and asked, “Does this look normal to you?” She responded with, “Well back in those days who knew?” Oh mom. I had a good appetite and ate a lot but never put on any weight and I felt miserable all the time. The breakfast foods my mom gave us kids each morning such as hot and cold cereal, pancakes, toast, muffins, bagels all contained gluten. I also had an intolerance to lactose, which is a common side effect of untreated celiac disease. In those days, like most kids, I drank milk morning, noon and night. Jeez! Talk about adding salt to a wound. Some of the common symptoms of celiac disease are bloating, constipation, diarrhea, gas, joint pain, inability to gain weight, constant fatigue and frequent headaches or migraines. According to an article titled Diagnosing Celiac Disease on the Celiac Disease Foundation website, if you have celiac disease, there is a 1 in 10 chance that your children, siblings and parents have it too. Therefore, it’s important that they get screened for it. People experiencing symptoms should be screened as well. There are several blood tests available that screen for celiac disease antibodies, but the most common one is the tTG-IgA test. This article also stresses the fact that you MUST NOT be on a gluten-free diet when doing the blood test. They suggest that you consume gluten for one to three months and then undergo an endoscopic biopsy without doing the blood test. Celiac disease is a genetic autoimmune disease that damages the villi of the small intestine and interferes with absorption of nutrients from food. Knowing everything my family knows about this now, we believe my dad and his mother both had celiac disease. Neither one of them had ever been tested but both dealt with stomach issues, depression, and irritability, I’ve had both of my kids tested. It was confirmed that my daughter has celiac disease. The endoscopy performed on my son wasn’t quite as clear cut. The test was inconclusive. As a result he has continued to eat gluten and will be tested again in the future. To learn more visit the National Foundation for Celiac Awareness website.